Auto-Responding to Email Inquiries from VRBO, HomeAway, VacationHomeRentals, Stayz, HolidayLettings, FlipKey, AirBnB, and others. One of the best ways to increase bookings is to respond quickly to inquiries. 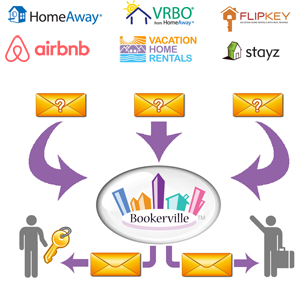 With a little setup, Bookerville can respond immediately and automatically to email inquiries sent by vacation rental listing sites. Step 2: Decide on Your Policy: Bookerville can send the auto-respond emails to both you and the guest, only to you, or not at all. Your policy can be different for each listing site and for each property. If you choose "Do not auto-respond", Bookerville will still collect the inquiry information and place it in your lead-management tool in your Dashboard ==> At-A-Glance tab. Some listing sites will let you specify a secondary email address to send copies of the inquiries to. If so, simply enter the Bookerville Auto-Responder email address into the appropriate field within the listing site. This is the preferred approach, so that when an inquiry is sent to you, it is sent to Bookerville as well. Contact your listing site account representative to ask about how to set this up in your listing site account. If sending inquiries to additional email addresses is not offered by your listing site, do not put the Bookerville email address into the only field available. This will create a single point of failure between you and your inquiries, and you don't want to do that. Instead, you will just need to make some specific settings through your own email software. Specifically, you will need to configure your email client (or system) to automatically forward the inquiry emails that are sent to you to the Bookerville Auto-Responder email address. Please be sure to set up auto-forwarding rules to only forward the inquiry emails - not every email that comes to you. If you need assistance with this, just ask. Sometimes, you can set up a "Rule for Sorting New Messages" to be able to forward just your inquiry emails to another email. (Live, Hotmail, Outlook (web-based) allows this). But if you are using more than one listing service (like VRBO and FlipKey), your free email service may not allow you to set up rules or filters for both of the corresponding email inquiries. In some email programs, you have to upgrade to a paid version in order to access the forwarding features. In Yahoo, for example, the filters don't support sending to another email address for a free account. Free email is just that: free. They don't have all the features that a paid email service will offer. You may find that you need to switch over to a paid email account in order to support your business needs. Bookerville is smart enough to send different messages, depending on what the guest included in the original inquiry email. Sometimes a guest is asking about availability for specific dates, sometimes they are just asking a question, sometimes they just want to know general availability (not necessarily specific dates). The dynamically-generated content outlined below is placed in the [INQUIRY AUTO-RESPONDER RESULTS] email tag, if you leave that tag in your 'Inquiry Auto-Responder' email template. By keeping this tag in your email template, Bookerville will send different responses to the inquiries depending on numerous varying scenarios. Read more about this in the Anatomy of the Inquiry Auto-Responder Email section, below. The best way to get familiar with the various dynamically-generated responses is to test the feature out on a single property first, and select the "Auto-respond only to me" option. This will allow you to make pretend inquiries in your listing site(s), and see first-hand what Bookerville would send to the guest if you turned on the "Auto-respond to me and guest" setting. The messages that are sent to your guests depend on what was included in the original inquiry email by the guest. There are many special responses that can result from inquiries, depending on many things, and we are constantly tweaking and updating this to keep up with new scenarios as we discover them with our members. Generally, there are two basic scenarios that can occur: either the requested property was available at the time of their inquiry, or it was not. Introduction: The guest is addressed by name, thanking them for their interest in your property, which is listed by name and also the listing site name and number, for continuity from their experience on the listing site. It then tells them that their requested dates are available, and they are encouraged to take the next step, which is to proceed with pricing, booking, or requesting. The clickable link takes them to the individual availability and booking/request calendar for this particular property, with all relevant information pre-populated (dates, name, email address, etc.) The link itself will say "Book Now" if this property is running in Guest-Centric mode; it will say "Request Now" if it's running in Manager-Centric mode. Requested Property Details: This colored table (colors match your custom-colors) displays the requested property, a "thumbnail" photo of it, the name, the occupancy, whether or not it is available for the requested dates, pricing (estimated), and links to either proceed with pricing/requesting/booking, or to visit the property's web-page (defined in your Bookerville Property Setup page) for more details. Since pricing in simple listing sites is often very limited compared to what Bookerville provides, a disclaimer under the table lets them know that the presented pricing is an estimate. Other Properties: The gray table displays up to ten other properties in your Bookerville account, sorted by availability. If rates are not set for any of these displayed properties (in either table) then instead of the estimated price, it will display an alert that rates are not set for those dates. Also, if your minimum-stay requirements are not met, it will tell them that and why. Final Next Steps: The email response is designed to persuade them to take the optimal actions first, but if they continue to scroll further down, there are more alternatives. Here, if you have multiple properties in your account, they are presented with a link to your Multi-Property Availability Search tool, with dates and other data pre-populated for their convenience. Finally, they are encouraged to contact you if they need or want more assistance. Bookerville uses the contact information provided in your Dashboard ==> Account Settings tab to present this information at the end. Availability Calendar: a graphical calendar is presented showing the availability of the requested property surrounding their requested dates, so that they can visually see how they might alter their dates in order to squeeze in. Flexible Dates? It poses the question that if their dates are flexible they can explore availability by clicking the link to go to the Availability and Booking calendar for the requested property. 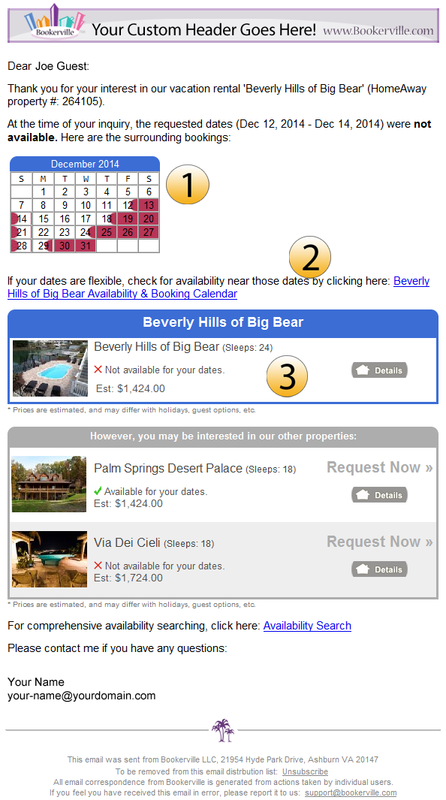 Pricing: Pricing is still shown so that they can see what it would cost if the dates were available. If any of your min/max stay rules are not met, this is also shown. What if my listing site is "hiding" the guest email address? Some listing sites are trying to do this. If they hide the guests' email address, then Bookerville cannot automatically respond to the inquiry, although it will still get read and logged into your lead-management tool in your Dashboard ==> At-A-Glance tab. Contact your listing site representative, and tell them you are using an Auto-Responder, and this will likely get them to put the guest email address back in. We've had several clients do this with success. Be firm with them, and also mention that you're using Bookerville. What if the guest just asks a question, and does not choose any dates? The inquiries all appear in your Dashboard ==> At-A-Glance tab, and those with comments are shown with an icon, so you can manage these in one place. The Bookerville auto-responder email directs the guest to your availability & booking calendar with their information pre-populated, to make their experience convenient, easy, and fast. 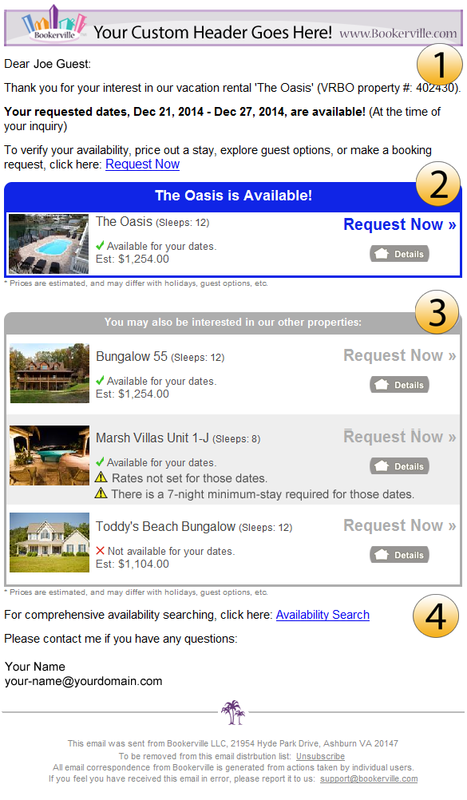 This may also happen if the guest entered dates that are not readable, although with recent improvements by the major listing sites, this is very rare now. What if I use my one listing (VRBO, e.g.) to market more than one property? Although this is probably a violation of your listing site's terms, there is nothing in Bookerville that will prevent you from doing it. You just enter your listing site property number in each of your Bookerville properties. This is why Bookerville always shows a list of up to ten of your other properties, so that the guests can shop around within your inventory. Can I customize the emails that are sent? Yes! Just edit the 'Inquiry Auto-Responder' email template for that property. You can by-pass the entire dynamically-generated content described above and simply direct them to contact you or click to your own website. Or, you can place anything you like above, and/or below the dynamic results. There are a few other things that can be customized, but if it's beyond the scope of what is described here, please contact us. What Happens When It Doesn't Work Correctly? Although recently things appear to have stabilized rather nicely, due to the nature of this beast, this process will at times likely not work as intended. That is because the listing sites are each their own companies, and they can change the format and content of their emails at any time (and therefore break Bookerville's ability to read them). Unfortunately they do not let us know when they do this. If you encounter an issue with our auto-responding process, please let us know asap, and we will do what we can to adjust the Auto-Responder to parse the new emails properly. Why are the emails so "skinny"? With the continuing trend towards people using smaller screens, and additionally, turned the "wrong" way (i.e., vertically), our emails are all designed to be readable on "mobile" devices. They still work very well on larger screens, so this style facilitates the widest possible audience. Formatting Issues There are dozens of popular email systems out there, and each one has unique problems when displaying "HTML" content in emails. Bookerville has developed these emails to be as widely compatible as possible, to ensure the greatest portion of the world-wide audience will be able to view them in the best possible display. But this imperfect landscape is always changing, and we are always adapting to new trends. If you are seeing these responses coming in with odd formatting, missing graphics, or other display issues, it doesn't mean your guests are seeing the same problems. And vice-versa: just because the emails appear perfect to you, doesn't mean the guest is seeing the same perfect display. Moreover: when guests reply to or forward the response to you, very often the process will strip out graphics, and/or ruin formatting. Despite three decades of intense and widespread use, email remains wildly inconsistent and unreliable in terms of display formatting. May we all push the major email providers for improvements.